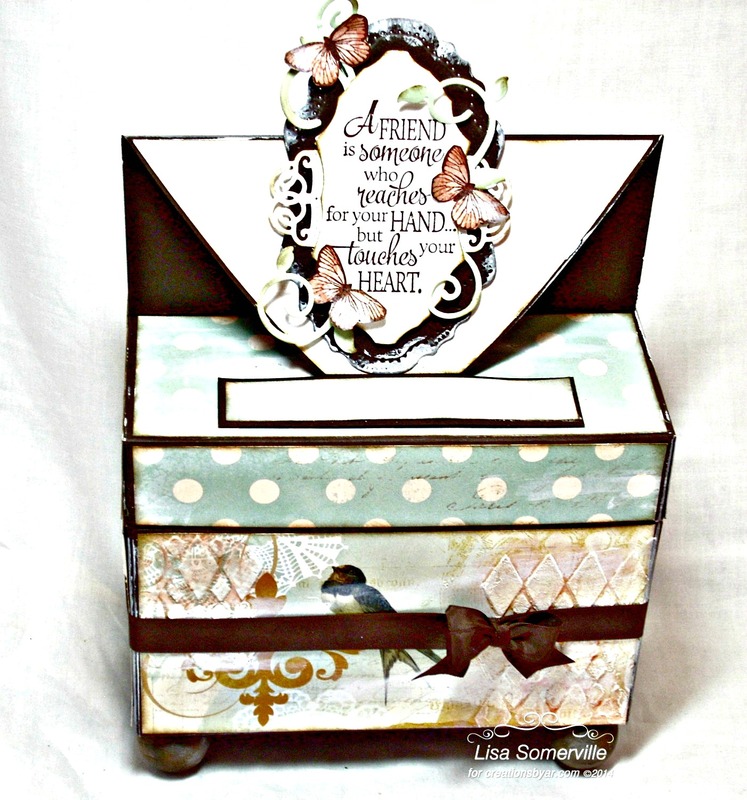 Designs by Lisa Somerville: Creations by AR April Design Team Blog Hop! Creations by AR April Design Team Blog Hop! Welcome to the Creations by AR Design Team Blog Hop! 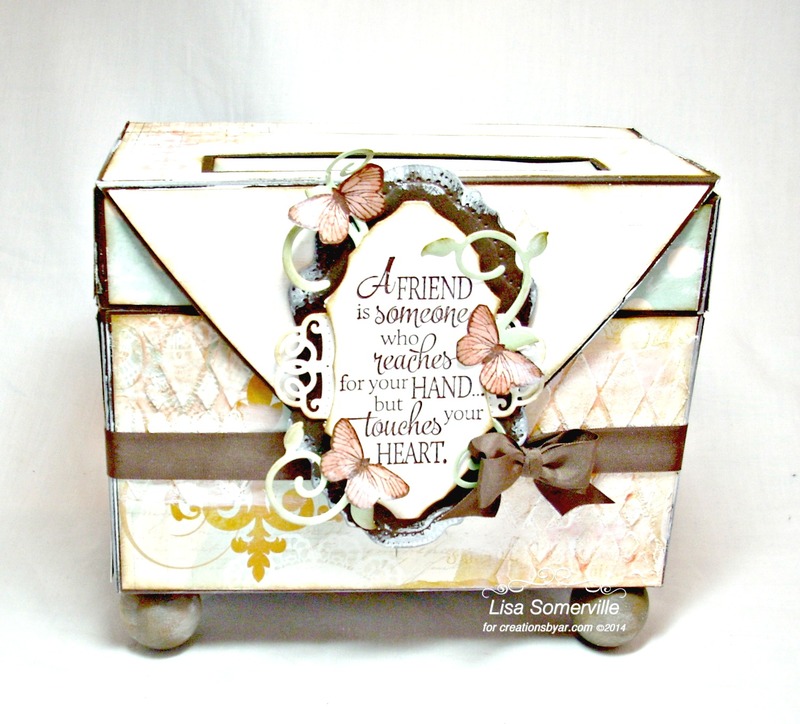 This month the Creations by AR Team members are sharing creations made with the new Easel Top Box Template. Continue reading below to see how you can win this new template! There are many uses for this fabulous template, I created mine as a gift for a friend to hold a set of A2 greeting cards. I used the Silhouette Cameo to cut my template pieces from Bo Bunny Pattern Paper and Espresso Card Stock. The photo at the top of my blog shows the Easel Top Box with the lid closed, I adhered the quote/die panel with magnets so it could easily be moved up in order to have it fit nicely on the easel portion of the box. The quote is from Our Daily Bread Designs Quote Collection 4, stamped in Espresso ink on White card stock and die cut/embossed using the ODBD Custom Vintage Flourish Pattern Die. I layered the stamped panel on an Espresso panel that was also die cut/embossed using the ODBD Custom Die. To embellish the quote panel, I added flourish die cuts from Pistachio card stock using the ODBD Custom Fancy Foliage Die, and stamped butterflies using the Stamped By - Butterfly Mini. To add depth and interest to the Bo Bunny pattern paper, I applied DecoArt Modeling Paste, through the Bobby Stencil from Just a Trace. Once the Modeling Paste was dry I applied DecoArt American Multi-Surface Satin Acrylic Paint in Poppy over the paste, blending with a little water to add additional color. To decorate the side panels, I created an internal offset using the Silhouette, and cut the template pieces from Bo Bunny pattern paper. To complete my Easel Top Box, I randomly applied Gesso over the papers and card stock, adhered Vintage Brown Seam Binding around the box, and added some Wooden Split Balls that were painted with DecoArt American Multi-Surface Satin Acrylic Paint Coffee Bean. To participate and be eligible to win, simply leave a comment on each designers blog hop post by Friday, April 11, 2014, NOON EDT. Comments will also be accepted on the Creations by AR PCP Group and Facebook Page. The random winner will be announced on April 12, 2014, on the Creations by Facebook Page and Adela's Blog. So pretty with the lovely papers you used Lisa and the stenciling with the Gesso adds a nice texture - and, of course, love the feet you put on your box! This is such a pretty, shabby chic look! 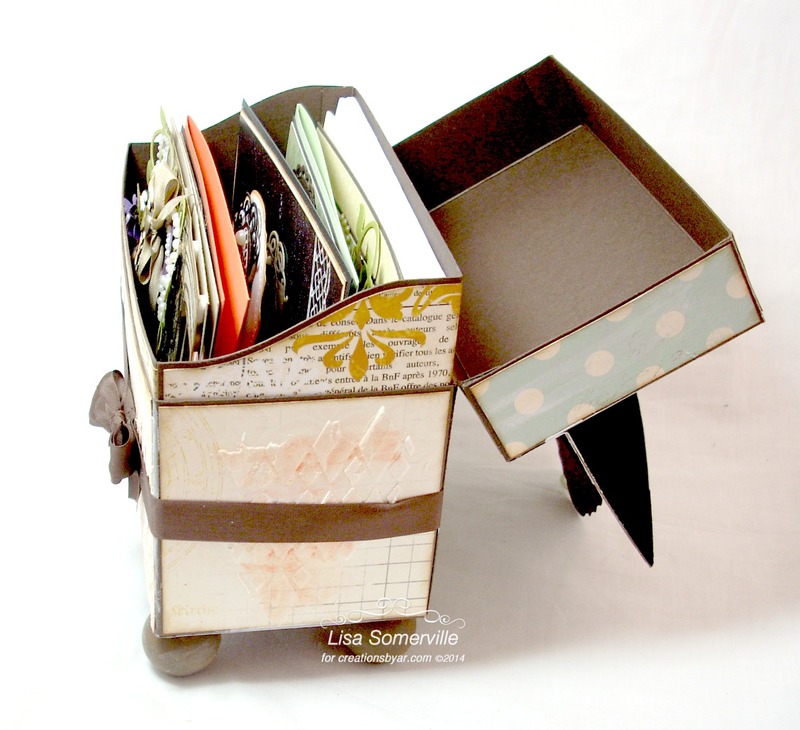 Love the papers you have used and all the little extra bits! Love the new template and your design especially the paper you used. I also like how you added feet to the box. Love the paper you used! Great job. Hermoso proyecto, me gusto muchisimo el detalle de la tapa, me gustan las mariposas!!! Love the idea of putting it on feet. I can see these being great gifts. What a lovely idea for use the new template. Love the way you combine the different papers and colors! Lisa, love your work with modeling paste, it turns out beautifully. What a beautiful box ! It is unique and so versatile! Such pretty papers. Your friend will love the gift. 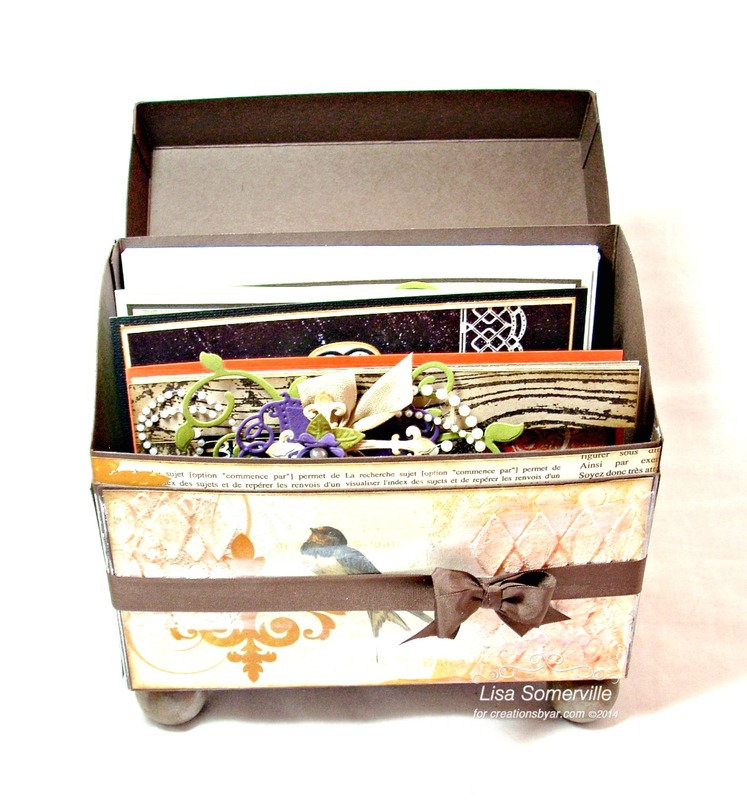 Love your box design to hold A2 cards Lisa! I especially like how you applied gesso to it the Bo Bunny papers. Love the addition of the ball feet to your box. Perfect for the papers you chose. Very pretty! Beautifully done, Lisa! Love the magnet closure...great idea! Such beautiful work, as usual! I love the removable quote panel and nice tip with the magnet. Thanks, Lisa. You are the best! Your ribbon and bow finish your box off perfectly. Love this design, and papers you used. Such a great idea! I love the "feet" you put on the box.